Lawyers around the world are gearing up for an international day of protests and activities in solidarity with their colleagues in Egypt who are facing arrest and persecution for their work defending victims of human rights abuses. On 24 January, the Day of the Endangered Lawyer will see lawyers in a score of cities join protests and events highlighting the dangers and difficulties faced by Egyptian lawyers. Today in Egypt, human rights activists, lawyers, political activists and independent journalists, all have to live with their phone calls being tapped, endless smear campaigns and hate speech from state – affiliated media as well as continuous harassment and intimidation from the authorities,” the organisers said in a report published last month. “Lawyers pay a heavy price. Many of them are victims of arrest, conviction, threats, travel bans from the territory and other restrictions on the practice of their profession,” the report added. National and regional Bar Associations and Law Societies are taking part in the day of action, including the Council of Bars and Law Societies of Europe (CCBE), the Law Society of Upper Canada, the Belgian Ordre des Barreaux francophones et germanophones. Lawyers wearing court robes will gather to protest at Egyptian embassies and consulates in Amsterdam, Barcelona, Berlin, Bordeaux, Geneva, The Hague, Madrid, New York, Paris, Rome, Toronto and London, while meetings and event will take place in many other cities across the globe. Dr. Nancy Okail is a human rights defender from Egypt. She is the Director of the Tahrir Institute for Middle East Policy in Washington DC. In 2013, she was tried in absentia and convicted to five years imprisonment in proceedings in which 43 NGO workers were charged with using foreign funds to foment unrest in Egypt. Prof. Lynn Welchman is Professor of Law with particular reference to the Middle East and North Africa in the SOAS School of Law, where she teaches Law and Society in MENA, Human Rights and Islamic Law, and the International Human Rights Clinic. Before and alongside her academic career, Professor Welchman has had both a professional and a volunteer NGO human rights engagement, mostly in the Middle East. She is a member of the founding editorial board of the Muslim World Journal of Human Rights, the Board of the Euro-Mediterranean Human Rights Foundation, and the Board of Trustees of INTERIGHTS. A human rights group is calling on Arlene Foster to raise concerns about human rights “including the use of torture” and “the vast number of executions” during her visit to China. Amnesty was speaking as the First Minister begins a four day visit to China to drum up trade and tourism. During the visit she will meet with the Chinese Vice Premier, Madam Liu Yangdong in Shanghai to “promote economic, education and cultural opportunities for Northern Ireland”. First Minister Arlene Foster said: “The links between Northern Ireland and the People’s Republic of China are strong and growing. “This week’s visit underlines the continued commitment of the Northern Ireland Executive to engage with China, the world’s second largest economy. We may be a small country but we have a compelling proposition in terms of commerce, tourism, education and cultural opportunities. 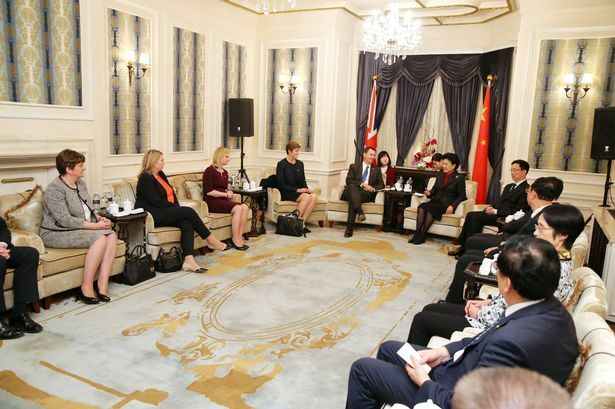 In a report set to be launched in Westminster on Tuesday afternoon, MPs and activists will chronicle the rapidly deteriorating situation since Xi took power in late 2012. The report, called The Darkest Moment, details a severe crackdown on human rights lawyers, the suspected abduction by Chinese security agents of a group of Hong Kong booksellers, the growing use of televised forced confessions and attempts to cow free speech by detaining dissidents, bloggers and journalists. Fiona Bruce, the chairman of the Conservative party’s human rights commission, said witnesses heard by her group complained of “a severe deterioration in human rights” under Xi, revealing what some now believed was the most intense crackdown since the roundup of protesters following the 1989 Tiananmen massacre.